A rare example of Fredrick W. Beers' Map Brooklyn, New York. 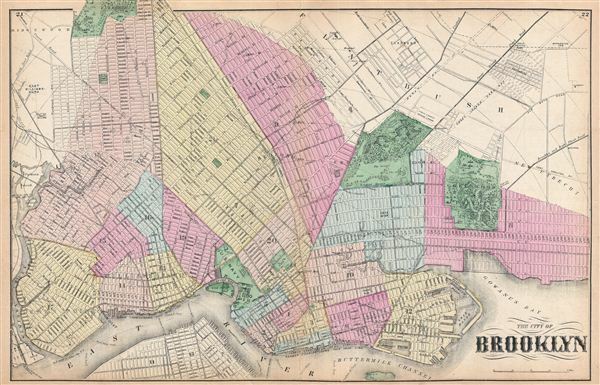 Published in 1873, this map depicts Brooklyn, Greenpoint and Williamsburg. Features detail to the street level showing individual buildings, parks, and street names. Offers exceptional detail in Prospect Park and Greenwood Cemetery, areas generally neglected by earlier maps of the city. Prepared by Beers, Comstock & Cline out of their office at 36 Vesey Street, New York City, for inclusion in the first published atlas of Long Island, the 1873 issue of Atlas of Long Island, New York. Good condition. Original centerfold. Backed with archival Japanese tissue for stability. New York Public Library, Map Division 1527263.